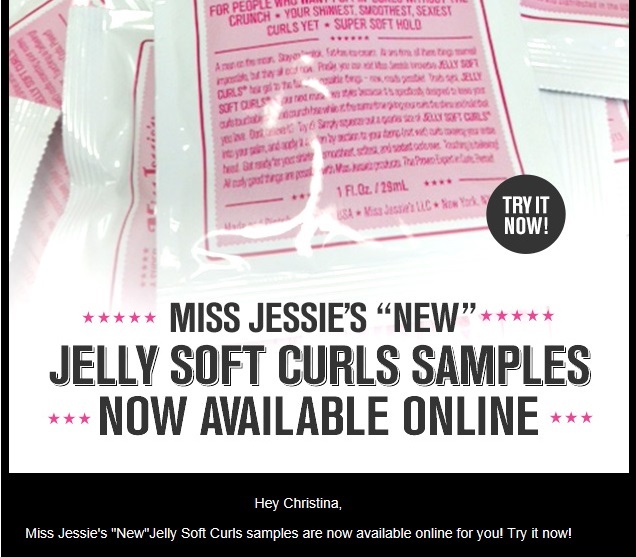 The Mane Objective: Free Miss Jessie's Samples!!! 1. Their products are generally based in petroleum and mineral oil...and if you care, artificial colors and fragrances are in there, too. 2. Despite #1, their products cost A LOT of money. As in $38 - $58 for 8 and 16oz jars and tubes. Petroleum (Vaseline) and mineral oil (baby oil) are two of the cheapest product bases out there. How on earth do you justify those price points? Yet, somebody is keeping them in business. That's why when I saw that e-mail (above), I was all the skeptical. You... Want ME... to... try something else? After this debacle with the Curly Pudding? Oh-kay, let me see. At first, I almost deleted the e-mail (recalling my prior experience). But I decided to check the ingredients out online (it appears that Miss Jessie's has become a little more transparent, listing their ingredients alongside the product). Hmm, Water (Aqua, Eau), Polysorbate 20, Glycerin, Carbomer, PVP, Triethanolamine, Sodium Hydroxymethylglycinate, Fragrance (Parfum), Disodium EDTA, Hydrolyzed Wheat Protein. Sure, a couple of those ingredients I'll have to research, but I'm comfortable with at least the first 3. So I forged ahead, and ordered 4 sample packets. Yeah, 4. In the "Quantity" box, put however many you want (I put 4 just to test the waters). Later on when you confirm your order, DO NOT alter it and try to add more....the system will boot you down to the 2 free sample limit. Continue to confirm everything. You will see a shipping charge for $1...if this bugs you, then back out and go to the 2 free samples. Pay the buck, and get your stuff. Let me know how it works for you!!! I'm really curious to try mine out... hopefully its not a disaster. Have you researched the ingredients yet? If so, please fill me in.